Coming from Ipoh, Timothy Lim Wern Liang began his journey in music and creative arts at a young age, serving in youth and worship ministries. He started learning guitar at 12 years which led to other instruments such as the drums, bass and lead guitars. 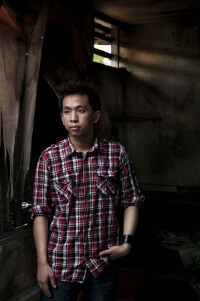 By age13, he was already serving as a musician and worship leader at his hometown church, St. Peter's, Ipoh. He began songwriting since the age of 17. Tim released his debut album 'This Road” in 2009 which was aimed at reaching young people, challenging them to make right decisions and walk closely with God. The songs represented the phases in his early life, his tertiary education and his graduation into working life. He released his second album, “The Day After” on 21 July 2012. This album also marks Tim's journey into maturity through his song writing and ministry. One of the themes in the album is 'Hope', an anchor in the midst of storms. Tim is presently serving full time in the worship ministry of Faith Christian Centre, an Anglican church in Bandar Sunway. Busy as it seems, he believes music is a gift from God which we must be used wisely.